Like using dill and chives, shiso (perilla) can also be an aromatic addition to softly scrambled eggs. Some people love its airy, floral, lemony, and almost minty aroma, while others turn away from the strong scent. 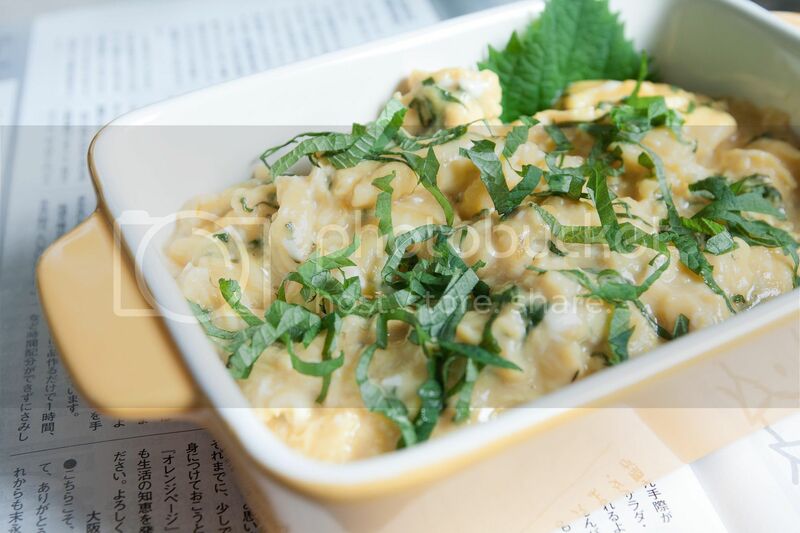 But do give it a try, the butter used here helps in smoothing out the taste, and if you're not a big fan of shiso, just use half of the portion indicated on the recipe. 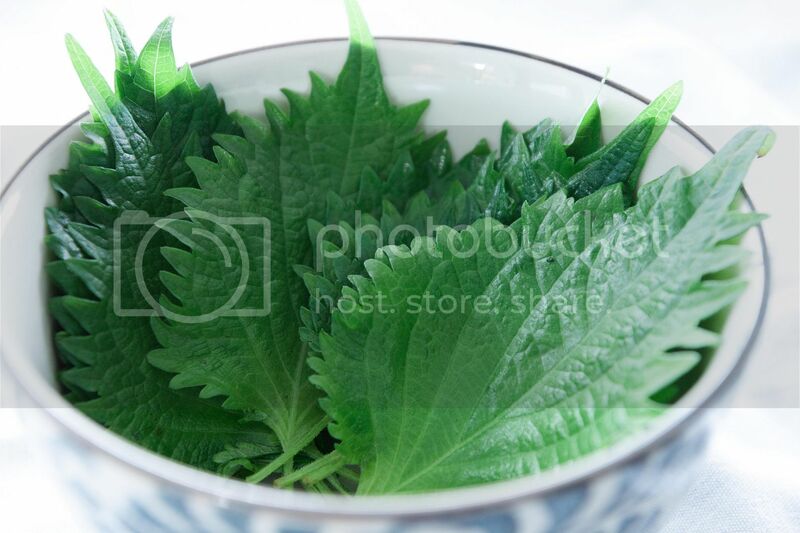 In a case of shiso leaves, a little goes a long way. Prep the shiso leaves first. Use just 5 leaves if a lighter herbal scent is preferred. Chiffonade the shiso leaves by laying them on top of each other, roll up into a tube shape then thinly slice it. Beat all the eggs in a medium sized bowl. Add most of the shiso, but save some to sprinkle on top of the scrambled eggs later. Add a splash of water, also sprinkle tiny pinch of salt and beat well. It's very important to use a non-stick pan if you're not sure about oil/heat control. It'll tremendously help preventing the eggs from sticking onto the pan. Add the butter and turn to medium low heat. 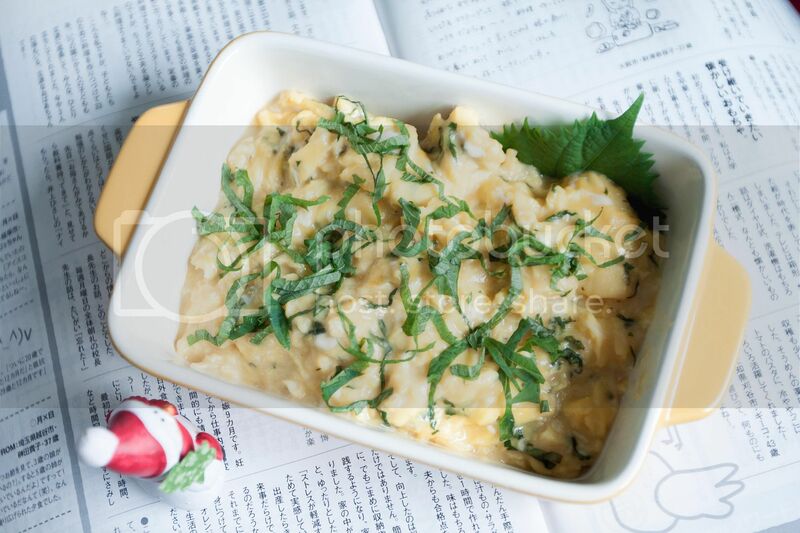 Once the butter melts, pour in the shiso egg mixture and softly scramble it. Keep gently folding the eggs around to prevent any single spot from overcooking. Not stir-frying it, but slowly folding the uncooked part to the heated area. Lower the heat a little if needed. The eggs are ready when the mixture is still slightly runny. Once removed from the pan, the residual heat will continue to cook the eggs, and the texture should be just about right when serving. The amount of salt used here yields a very light-tasting scrambled eggs. Use more salt while beating the eggs or just sprinkle some salt over finished product at the table. By the way, belated Merry Christmas!